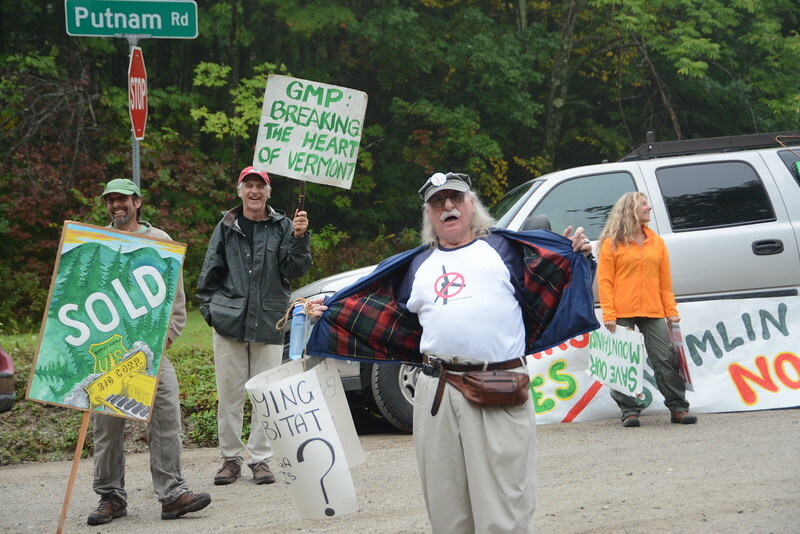 READSBORO >> Inconsolable views of the wind power industry in Vermont were offered Monday morning by groups starkly separated by a perimeter line manned by Vermont State Police. That checkpoint was located just off Route 8, atop a small hill on Putnam Road, where Gov. Peter Shumlin, local officials and representatives of Avangrid Renewables, which will soon begin construction of 15 wind turbine towers on Green Mountain National Forest land, held a formal groundbreaking. The event took place under a slight drizzle and amid intermittent fog over the ridgeline, after more than a dozen years of complex planning and permitting processes – and the developers had fended off vociferous protests and legal challenges to their Deerfield Wind project. 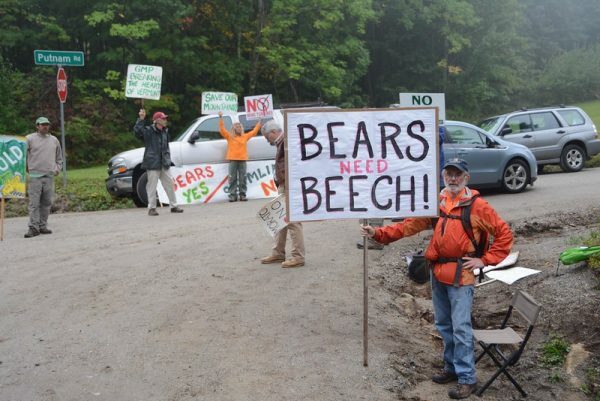 The protests continued in force and in earnest Monday, with about three dozen people from around Vermont and from nearby Massachusetts holding signs, shouting, at times chanting or singing – especially as Shumlin’s SUV drove past toward the site. In his remarks, the governor thanked the developer, the U.S. Forest Service, which is permitting the first wind power facility in the nation on its lands, and those officials and residents of the area who have “stuck it out” despite intense opposition over the long haul of the permitting process. “I want to tell you why this matters,” Shumlin said, adding that climate changes over his lifetime, and particularly over his six years as governor, point to a critical need to replace fossil fuel generated power with renewable resources like solar and wind. He said residents can observe the changes in Vermont’s milder winters, which threaten the ski industry, and in the increase in invasive species that now thrive in the warmer climate. Shumlin, who early in his tenure announced a goal of getting almost all of Vermont’s energy needs from renewable sources, said that since he took office, Vermont has 11 times the number of solar panels and 22 times the wind-generated power it had. And that activity, he said, has directly impacted the state’s economy through employment in those industries and through lower electricity rates than any state bordering Vermont. Many of the jobs created have been good-paying ones, he said, and they have “brought young people to Vermont,” sometimes to settle and raise families. The Deerfield Wind project will consist of two rows of turbines on ridgelines on opposite sides of Route 8, located in Searsburg and Readsboro, both on a total of about 80 acres of Green Mountain National Forest land. The developers – formerly known as Iberdrola Renewables – said they intend to invest about $80 million in the 30-megawatt wind project, which they estimate will produce enough power to supply the equivalent of 14,000 homes. Green Mountain Power has signed a 25-year agreement to purchase the power generated at the facility. The two towns are expected to receive about $6.8 million in taxes over the life of the project. The tips of the turbine blades would range from 400 to 430 feet from the ground at the highest point in their turning radius, officials said. The new turbine towers will stand in the neighborhood of a smaller wind project in Searsburg that opened in 1998. While enthusiasm and relief at the project start was evident atop the hill, just below the police checkpoint, and stretched along the driveway down to Route 8, protesters decried what they said was a victory for corporate interests over those of the average citizen. “Bears yes, Shumlin, no,” stated one sign, referring to a long permitting appeal battle over the project’s potential impacts on bear habitat. “Shame,” proclaimed another of the 20 or more signs officials passed to reach the ceremony site under a tent canopy. Annette Smith, of Danby, executive director of the nonprofit Vermonters for a Clean Environment, has been a leader in the protests against industrial wind projects here and at other locations in Vermont. On Monday, she was dressed in a Batwoman costume – representing she said one of the species that could be affected by the project – walking up and down the driveway. She roamed the protest site, sometimes talking into a walkie-talkie, sometimes shouting encouragement, often engaging in a shouted dialogue with other protesters that included a running commentary on the project and about the officials driving past. Referring to the existing 21-turbine Lowell Mountain wind project near Craftsbury, Smith said she has submitted to the general counsel of the state Agency of Natural Resources a request for a stay of the Deerfield Wind project, based on what she said are problems with the operational stormwater runoff system at the Lowell Mountain site – one Smith said is similar to the Deerfield Wind design. The letter then cites several failure issues with the Lowell system VCE had previously asserted in July. Smith said she believes it’s important that opponents of industrial wind projects continue to closely scrutinize the projects even after they become operational. If there are no delays, the Deerfield Wind project is expected to go online by late 2017. Also among the protesters was state Rep. Marianna Gamache, R-Swanton, who is a member of the House Committee on Natural Resources and Energy and has introduced legislation that would increase public notification requirements for proposed renewable energy projects and give communities the right to veto larger projects. Gamache said she was denied entrance to the groundbreaking area. “All I wanted to do was attend and listen to what was being said,” she told reporters. “I am not obstructing anything or anyone” and was trying to “find out all about this,” as a private citizen as well as a legislator, she said. Members of the media also were asked to RSVP to confirm in advance that they would attend, and their names were checked as they entered. Some protesters said they live near another project proposed by Iberdrola Renewables, proposing a total of 28 wind turbines in Grafton and Windham, and attended in support of the Deerfield Wind opponents. Michael Fairneny, of Florida, Mass., said he and his family have suffered medical and quality of life effects of living near a 10-turbine Iberdrola Renewables project called Hoosac Wind and located in the town of Florida and in Monroe, Mass. He said has suffered from headaches and his wife has experienced tinnitus since the Massachusetts project went online three years ago. Almost every appeal by citizens or groups of wind projects has fallen before what Smith asserted was intense political pressure on both the state and federal levels to issue approvals and permit for wind developers. The project developers also agreed to a bear habitat mitigation plan as part of a settlement of appeal issues and will help fund ongoing bear research efforts. John Sinclair, Forest Supervisor for the Green Mountain and Finger Lakes National Forests, said the Forest Service will have a permit administrator on site during the project to monitor the mediation efforts.